(Newser) – Amazon's got a host of new gadgets on the way. Founder Jeff Bezos today announced the Kindle Fire HD, an upgraded tablet that comes in two sizes, starting at $199, USA Today reports. "We were happy last year to have the best tablet at a certain price. 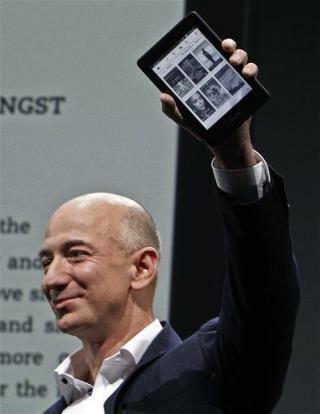 This year we want to have the best tablet at any price," Bezos said. The tablet is available in a 7-inch version, an 8.9-inch version, and an 8.9-inch 4G LTE version, notes the Verge. Great! More people walking down the street and in the store not paying attention to where they are going. Great! I love Amazon. They actually own their platform. They sell computing time to geniuses at MIT. They've been around forever in this world and built something unlike Facebook that's just a glorified website. I will admit that I made 8 thousand on Facebook yesterday on their two percent swing. I'm one of those bad people who trade for a few hours. Hey, it's capitalism. The only thing dummer than a poor Republican is a Democrat who thinks that things should be fair. It's dog eat dog. That's all capitalism is and until they change the rules--I'm a daawag.